Below in the Tour Dates section, see upcoming performances in Asheville, and Fort Worth, TX, expos in NYC and Dallas, and a radio show this Friday. This winter I've been involved in guided meditation recording projects with two powerfully inspired guides, Panache Desai and Suzette Faith Foster. It has been a blessing to work with each of them, and I'll let you know when their recordings are available! Here's "Circular Mind," from Sky Jazz for a Springtime energy! Elizabeth Joyce is on the air with the famed musician Richard Shulman. 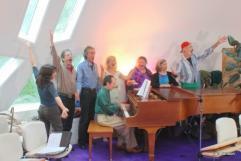 (www.richheartmusic.com) Richard's teacher was the beloved Hilda Charlton who taught her "kids" at St. John The Divine in New York City. 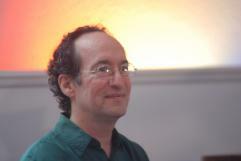 Shulman has dedicated his life creating music for meditation, inspiration, healing, and enlightenment. He is loved for his ability to create a Musical Soul Portrait for you to open your heart and brighten your soul. Richard is best known for his creation, Light from Assisi, that he composed at the birthplace of St. Francis. This music is described as..."the music seems to alter the very atoms and take us into a place of inner mystery and beauty. Intensely personal, it explores the humble and the Divine with equal sincerity. Shulman holds nothing back." Richard and Elizabeth created The Chakras and Your Body, a meditation that opens your Third Eye. This work prepares you to dive into your inner core and raise your vibrations to ascend, which can reveal your personal pathway to self-fulfillment by following Divine inspiration. Expect to hear some of Richard's new work as well as to find out just how the music of the spheres helps us to grow into the power of oneness and love. The promo video for the musical "A Dream of Camelot"
Russ Willson's "POPS" CONCERT - A SALUTE TO PAUL WHITEMAN with a 28 piece orchestra playing the actual, authentic 20's/30's arrangements of the The King Of Jazz, Paul Whiteman. Tickets are $20 for adults, $10 for Children 12 and under, $15 for UNCA faculty and staff, $6 for UNCA students and can be purchased at the door the day of the concert. I'll be playing keyboard for the services with special music. Sat. April 24th Morganton, NC 10:00 am - 4:00 pm Morganton, NC's Earth Day Celebration. Catawba River Soccer Complex on the Greenway. I'll be playing for the Earth and will have CDs available at a table. I was reading the liner notes from my 1997 release with Samuel Welsh, Keeper of the Holy Grail and thought to share it with you in my blog. 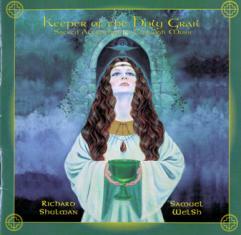 The intent behind Keeper of the Holy Grail was to create music and energetic attunements that would assist listeners in feeling the Divine within. The liner notes reflect that intent in some depth. Under the category "What's behind the music." I'm continuing interviews with various composers, performers and recording artists in a fabulous new magazine called New Awareness Magazine. The current interview in the February - March issue is with Steve Gordon of Sequoia Records. The April - May issue will have an interview with sound healer/vocalist Suzanne Mousette.